How to use encouragement as a discipline tool. You can encourage your child to correct your child into changing behavior. Every time I read one of the -wise books, I find it interesting how something new strikes me. Right now I am reading through On Becoming Toddlerwise again. As I have read through, I have been struck by the idea of encouragement. 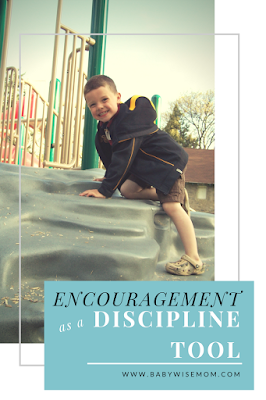 “…certain behaviors will always be followed by disappointing consequences, and other behaviors will be followed by praise and encouragement” (Toddlerwise, page 96). Perhaps some of you are like me. When your child first starts doing what you tell him to, you offer praise and encouragement. As he continues to be good and obedient, however, you start to become lax in the encouragement department. You start to take this obedience and good behavior for granted. As you do this, you continue to offer the consequences and punishments for poor behavior. Is that a problem? I absolutely think it is a problem. People operate best with positive reinforcement. When you take the encouragement from your child and maintain the punishments, there are not positive words to keep him going. He can become frustrated and feel like he can never be good enough no matter how hard he tries. Think of yourself. Chances are you can think of plenty of things you do that seem un- or under- appreciated. Those thank yous and kind words from friends, family, co-workers, strangers, etc. keep you going. Some of you are better at giving compliments and encouragement than others. I am one who is not as good at giving compliments and encouragement. I think them, but I don’t verbalize them like I should. Every so often Brayden will say to me, “That is a good boy to XYZ, huh.” I chuckle. He reminds me when he is in need of encouragement. We must be conscious of encouragement. We must let our children know when they have made a right decision. We must let them know that we notice and appreciate how hard they are working. Be complimentary of them. This will give them the fuel to keep working at improving themselves. I LOVE your blog. I am so thankful it is out there for all of us to learn from. 🙂 I have a question about solo play time. I have read all the posts you have tagged but have some quick follow up questions. My daughter is 10 months old and goes to a sitter 2 days a week, goes to her grandmothers 2 days a week and then is at home with me (and my husband) for the other 3. We both have full time jobs, which makes BW more challenging in the first place since there are 3 sets of people implementing rules. I am sad we have not started solo time yet, as I think she NEEDS it but I am at a loss at how to make it happen when she is in 3 different homes each week. Not to mention church on Sundays! I know we need to start small…. but do you have any suggestions as far as starting up goes? Do you put her out of sight (but in earshot or with a monitor) and let her CIO for a bit or do you just stay in there with her and not interact? should I request that the sitter put her in her play yard in a differnt area of the house so she doesnt see or hear the other kids (non BW) playing? If you do CIO, how long do you let them cry and does it break trust when using it for playtimes? Thank you in advance for all your help and suggestions! I was listening to a momsnotes presentation just this afternoon on children’s love languages and one of them was encouraging words. You are right. It is so easy to be a “nag” to our kids, if you will. Praise and showing love to our children in the way the meets their needs best can curb so many problems. I love the love languages idea. I read the book. William doesn’t ask me to provide encouragement. He asks me to play with him. He plays well on his own, but quality time is definitely his love language. Thanks for the reminder! I agree about children needing more praise. I use to teach before I became a mom three months ago. One of the most motivating ways to get a child to do something or continue doing positive things is to offer continuous praise. Child seek attention and they don’t discriminate between negative or positive attention. I found that with the children that were often getting yelled at or in trouble were the children who where usually seeking attention. Unfortunately the attention they were after was negative. The teachers’ response to their negative behavior only helped to reinforce the poor behavior because the child was getting the attention he or she craved. I decided to not give as much attention to the negative behavior and focus on their positive behavior, which really helped to change a lot of the negative behavior that I was seeing in the children. Just thought I was share my personal experience with praise! Thanks Traveling Turtle :)Pick a time that she can do solo playtime each day at each house. You might need to talk to the other two people to see when is best. Morning is usually a good time for most because we are all usually home in the morning. Do it at the same time each day. Do it in a play pen/play yard. If you have one, you can send it to each home. Put her out of sight and in a room alone. Start with short increments of time. If she doesn’t like it, start with 5 minutes. Get an egg timer and have everyone set it for 5 minutes and then get her when the timer dings. It might be good to start with 5 minutes even if she does like it and work up from there. Don’t work up until she stops crying for the 5 minutes. I would start on the first day she is home with you. Then she can do it for 3 days before you turn her over to someone else, giving you a chance to problem solve. Good luck! So true Atara. I love 🙂 love language. It is very interesting. I am sure you know all about encouraging words as a teacher. Susanne, thanks for that experience! I think classroom experience is valuable in behavior issues.